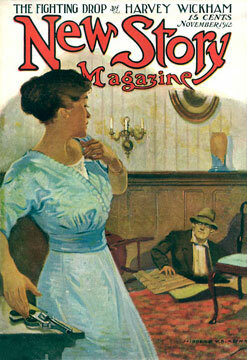 New Story Magazine was published monthly between August 1911 and November 1915, initially by the LaSalle Publishing Co. of Chicago (August 1911-January 1912), and from February 1912 by the Street & Smith Corp. It was edited by Archibald Lowry Sessions, and issues were 15 cents each. Despite its brief existence, the magazine had a complicated genealogy. In October 1910, Gunter’s Magazine (February 1905-September 1910) had been retitled The New Gunter’s Magazine. A month later, it was then retitled The New Magazine (November 1910-July 1911), which lasted less than a year before becoming New Story Magazine in August 1911. Contributors included H. Rider Haggard, Edgar Rice Burroughs, Edgar Wallace, and James Francis Dwyer. Between June and December 1913, New Story serialized Burroughs's The Return of Tarzan—a much-anticipated sequel to Tarzan of the Apes (All-Story Magazine, October 1912). 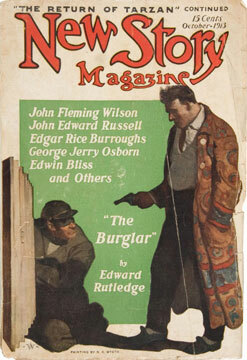 Two of the issues featured cover illustrations by N.C. Wyeth, one of which was used for the dust-jacket of the McClurg first edition of the novel. 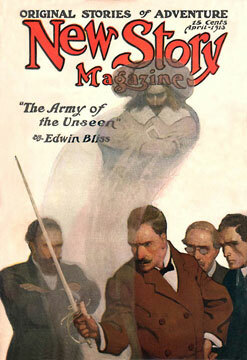 Burroughs returned to the pages of New Story Magazine in 1914 with his Gothic romance The Outlaw of Torn. Written in 1911 and subsequently rejected by the editor of All-Story, The Outlaw of Torn was purchased for $1000 and serialized in the January, March, April, and May 1914 issues. New Story Magazine ran for just 52 issues, until December 1915 when the title was changed yet again—this time to All Around Magazine (December 1915-March 1917). The magazine then lasted just two more years, before finally meeting its demise at the height of the First World War. Stephensen-Payne, Phil. New Story Magazine issue checklist. Accessed at http://www.philsp.com/data/data175.html#GUNTERSMAGAZINE. Zeuschner, Robert B. E.R.B. : The Exhaustive Scholar’s and Collector’s Descriptive Bibliography of American Periodical, Hardcover, Paperback and Reprint Editions. Jefferson, NC: McFarland, 1996. A incomplete checklist of scanned cover images is available @ Galactic Central.